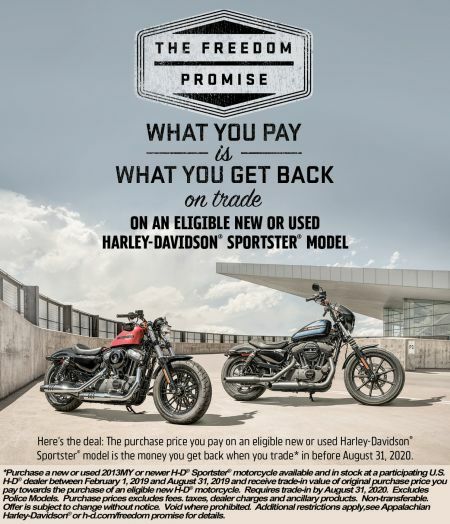 What you Pay is What you get Back on trade on an eligible new or used Harley-Davidson® Sportster® Model*. *Purchase a new or used 2013MY or newer H-D® Sportster® motorcycle available and in stock at a participating U.S. H-D® dealer between February 1, 2019 and August 31, 2019 and receive trade-in value of original purchase price you pay towards the purchase of an eligible new H-D® motorcycle. Requires trade-in by August 31, 2020. Excludes Police Models. Purchase prices excludes fees. taxes, dealer charges and ancillary products. Non-transferable.Offer is subject to change without notice. Void where prohibited. Additional restrictions apply,see Appalachian Harley-Davidson® or h-d.com/freedom promise for details.